Make the switch to QuickBooks Online. If you’ve been hesitant to migrate from the desktop version of this popular accounting application, this course will give you a complete overview of why there’s never been a better time to change. Learn how to set up and navigate QuickBooks Online and perform day-to-day transactions from a Certified Public Accountant and certified QuickBooks Pro advisor. 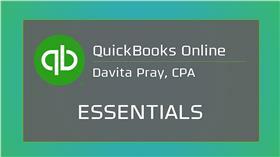 Don’t wait to switch from the desktop edition of QuickBooks to QuickBooks Online. This course, taught by a Certified Public Accountant, will provide you with a comprehensive overview and essential skills for operating this vital business application. This course is great for everyone from small business owners to financially-minded employees. The advantages of using the online version of QuickBooks. What to consider when setting up an accounting system. How to operate the Customer, Vendor and Employee dashboards. The essentials of the Reports, Taxes and Apps dashboards. Tips to customize your company forms and settings. How to import information from your QuickBooks desktop software. Advice for managing multiple users. Basic day-to-day transactions such as income, expenses and deposits. How to track your performance through reports. How to set up and run payroll through the application.